King of the United Kingdom and Emperor of India. 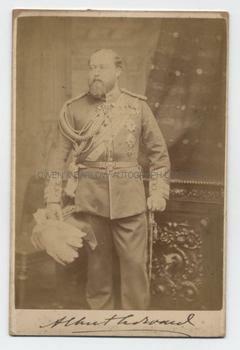 Photograph, signed (as Albert Edward, Prince of Wales). 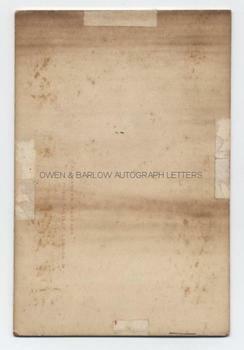 The gelatin silverprint photograph measures approx 6.5 x 4.5 inches (including photographer's pasteboard mount) and is a cabinet photograph bearing the photographer's name, Alexander Bassano, 72 Piccadilly, London, W., on verso of mount. Edward's SIGNATURE is written boldly along the mount at foot of image. The image is very slightly faded and the corners of the mount are a little rubbed. The verso bears the usual signs of the photograph having been mounted in a frame at some time and verso is a little dust soiled and foxed. The photograph is otherwise in very good, acceptable condition. A pleasing photograph of the haughty Prince standing, full-length, in Field Marshal's uniform with full chivalric orders and decorations. He holds a plumed hat in one hand and the other rests on the hilt of his sword. The photograph was taken circa 1883, when Edward was aged about 42.